I'm going to hang this on the wall opposite my bed so I can see it every morning. It has great messages to live by:) Thanks for this great product. I will most likely want to use these as gifts in the future. Just absolutely love this poster. 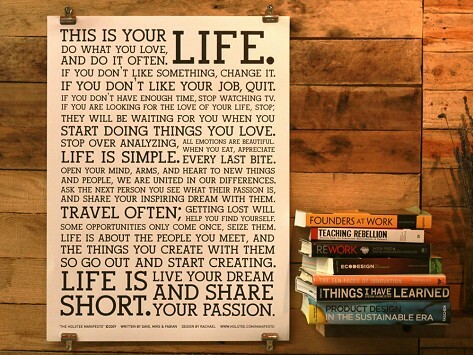 It hangs on the wall right in front of my desk where I can read it every day. Very uplifting messages. Well done, looks very nice. The paper is thick and the printing has a slightly raised texture to it. Thank you! From a Brooklyn-based company called Holstee comes a collection of cards, posters, and frames designed to inspire mindful living. At the core of each piece is the Holstee Manifesto, originally written by the company founders Dave, Mike, and Fabian, as a reminder of the things they most valued in life. In the Holstee Manifesto Poster, the inspiring message is letterpressed onto the finest quality tree-free paper made of salvaged cotton from the American textile industry. The Manifesto Greeting Cards let you share the company's words of hope and encouragement with others. And, with the Reclaim Frame, you can beautifully display a card that has touched your heart in a one-of-a-kind frame handcrafted from Douglas fir wood sourced from abandoned and deconstructed houses in Detroit.